Claire Underwood, played by Robin Wright, has always exuded feminine strength alternately pushing her husband Frank to the top and climbing there on her own rung by rung. In House of Cards’ Chapter 31 she outdoes herself by redefining political negotiations in that ultimate feminine space, the ladies room. Claire capitalizes on the power of this female domain, undermining her opponent, and forever transforming a simple bathroom into a site of female dominance. In the process she gives viewers a master class in gendered power relations. Claire who now serves as First Lady and US Ambassador to the United Nations advocates for her husband Frank who has murdered and plotted his way into the White House. Thus far Claire has not thrown anyone in front of a train nevertheless she demonstrates a frightening ruthlessness. Her promise to a woman who once opposed her – “I’m willing to let your child wither and die inside you if that’s what’s required” – comes to mind. Claire also reveals flashes of tenderness when least expected, suggesting that she has a heart beating somewhere beneath those Alexander McQueen dresses. These contradictions make her the most complicated female character I have ever encountered on television. Since I watched Wright’s sun-drenched Santa Barbara debut in real time that is saying something. Claire is no Kelly Capwell. We have yet to see her sunning herself in a bikini. Instead, she wears sleek suits and dresses in colors so muted she sometimes blends into the scenery, until she speaks and then all eyes turn toward her. This season Claire attempts to maneuver around a Russian veto in the UN Security Council to bring about Frank’s plan to install “peacekeeping” troops in the Jordan Valley. Russian Ambassador Alexi Moryakov stands in her way. 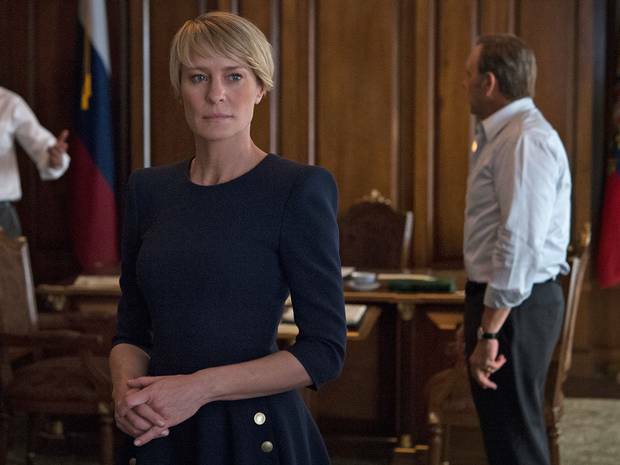 There are few more dangerous places on earth than in the path of Claire Underwood. Despite her explicit warning – “don’t underestimate my ability” – Alexi does exactly that. The Russian Ambassador obstructs her UN negotiations and belittles her by calling attention to her gender, dismissing her “little resolution” as something that should be left “to the professionals.” He adds, “The truth is you have no business being ambassador any more than I do being First Lady.” Before leaving their private meeting he turns back to Claire and remarks, “That’s a very nice dress by the way.” Alexi reminds Claire that diplomacy and world politics are still a man’s game. Unless that is, Claire Underwood comes to play. Claire operates in a world where women wield power within a patriarchal context. She understands how this system of unequal power relations works and uses that knowledge against her adversary. Rather than a conference room or a nice café, Claire orchestrates her next meeting with Alexi to take place in a women’s restroom. Her knowing female assistant pushes the door open for Alexi as Claire calls out his name as if beckoning him to her lair. He finds himself off balance from the moment he crosses the threshold into a room with the word “Women” emblazoned on the door. Matthew Weiner invited viewers into another “Ladies Room” in the second episode of Mad Men; an episode which serves as a tutorial in 1960s sexism. While the boys in the office wrestle over an aerosol can, Don asks Roger, “What do women want?” His glib response, “Who cares?” offers some insight as to why Peggy Olson runs into so many sobbing secretaries as she powders her nose. By Mad Men’s second season Peggy has earned a promotion from secretary to copywriter and shows flickers of ambition, at the same time that she still calls her boss Mr. Draper. In “The New Girl” [2.5] successful businesswoman Bobbie Barrett tells Peggy that “to get that corner office” she needs to “start treating Don as an equal.” Then she offers Peggy valuable advice, “You can’t be a man. Don’t even try. Be a woman. Powerful business when done correctly.” Claire Underwood would agree. In Claire’s ladies room, the game has begun. As promised, she is “only putting…makeup on” when Alexi arrives. Claire slides lipstick across her lips, looks at her prey and asks, “Good?” He replies with a flustered “Quite.” She touches up her eyeliner, turns her head toward him and says, “Eyes?” The stupefied ambassador appears entranced as he squeaks out an affirmation, “Perfect.” She smiles gratefully noting, “It’s always nice to have a man’s opinion.” Then Claire shocks Alexi and the viewers as only she can. She walks into a stall, sits down on the toilet and relieves herself in full view of a man who cannot form a thought while she lets her hand rest atop her legs. Claire chooses this moment to drop the sword telling Alexi that the President signed an executive order assigning troops to the Jordan Valley ensuring that “The moment you sell arms to Iran we will shoot the planes out of the sky, the trucks off the road and the ships out of the water.” She confidently stands, pulls down her skirt and flushes. While washing her hands at the sink she instructs him to “come back to the table” and negotiate, tossing in one more demand – “We need Michael Corrigan released” – before levelling the final blow, “Please hand me a towel would you?” He does so as if under a spell. 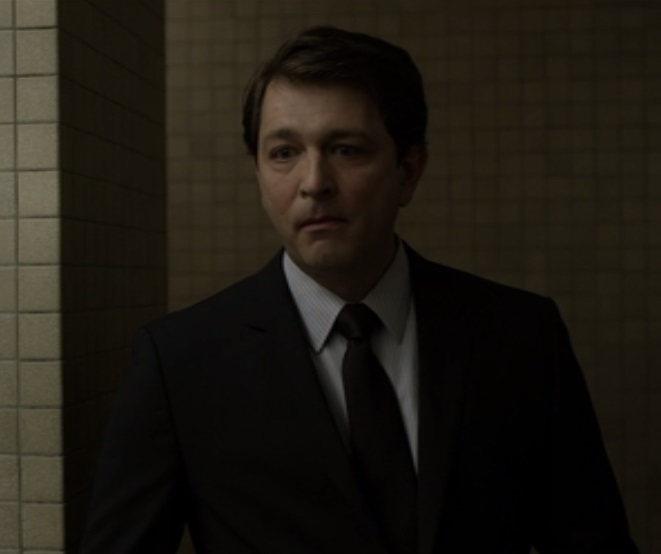 Claire looks him in the eye and says, “What a gentleman.” The only person crying in this ladies room is Alexi as he scrapes his manhood off the floor on his way out the door. Claire makes no apologies for her style, fashion or otherwise. She quietly watches, isolates her opponent’s weakness and then strikes. Those opponents never see her coming and like Alexi rarely form a coherent sentence in her wake. Ambitious women still live in a world where they are criticized for staking out territory, for seeking higher office or simply requesting one with a window. That is what makes Claire so mesmerizing. We cheer for her and we want her to succeed because the rest of us are still “leaning in” amidst reminders by men in the office to be nice lest our negotiating style does not meet their needs. Claire learned Bobbie Barrett’s lesson well. If you can’t stand with the boys and negotiate, sit down with the stall door open. It is powerful business when done correctly. Oooh! Nice analysis and comparison Poptraction!